When I bought my mini cheesecake pan, I really wasn’t sure whether I would use it. There are so many pieces of baking equipment stuffed into the back of my kitchen cabinets that never see the light of day, much less feel the heat of my oven. But I have used this pan over and over, much to the delight of my friends and neighbors. I receive so many compliments on the tiny cheesecakes that I almost feel guilty because they are so quick and easy to make! The cheesecake pan came with a starter recipe but I have had a lot of fun adapting it and creating new recipes. There are oranges everywhere in Sicily right now and I can’t get enough of them! I’ve been juicing them, peeling and eating them, adding them to green salads, and now their zest brightens up my latest mini cheesecake recipe. 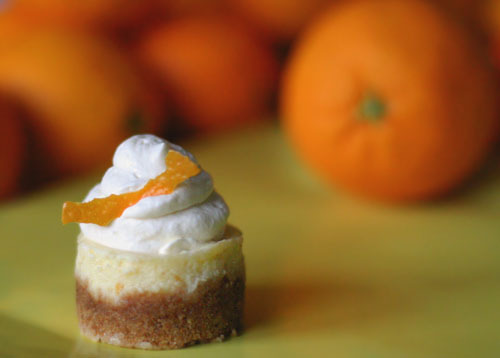 The Grand Marnier whipped cream is an optional but very delicious addition to these little cheesecakes. 2. In a medium bowl, mix graham cracker crumbs, sugar and butter with a fork until well combined. 3. Divide crumb mixture evenly between the 12 cups of your mini-cheesecake pan. Using your fingers or the back of a tablespoon, press crumbs firmly onto the bottom and partially up the sides of each cup; set aside. 4. Combine sugar and orange zest in a mini food processor and process until orange zest has been incorporated and sugar is fine (this step is optional, if you don’t have a mini processor move on to step five). 6. Spoon cream cheese mixture into the twelve cups, trying to divide the mixture as evenly as possible. 7. Bake for 14 minutes in a preheated 375 degree oven. 8. Remove from oven and place on rack to cool for 20 minutes then carefully remove cheesecakes from pan and let cool completely on rack. 9. Put cheesecakes in refrigerator and chill until ready to use. 10. Just before serving, combine cream (make sure it’s very cold), grand marnier and sugar in a mixing bowl and whip, using a hand whisk or electric mixer with whisk attachment, until soft peaks form. 11. Top mini cheesecakes with dollops of grand marnier cream and serve. I had no idea there was even such a thing as a mini cheesecake pan. Where have I been? Those look fantastic! Okay Nicole now you have me ordering the mini cheesecake pan. I hope this company treats you well! You bring them business! You have totally made me lust after a mini cheesecake pan!!! These are too gorgeous! Amazing! I need this pan! I really want that pan now! Nicole, are these the cutest dessert ever or what? I love to cook with oranges, lemons and limes, I love their smell, their taste - so refreshing! Everytime I see a recipe using citric flavors I feel like making it asap! I must have one (or a couple handfuls) of those! There are just so CUTE! Happy New Year, Nicole! Er...meant to say "THESE are just so CUTE!" Happy New Years, Nicole! as usual i would like to pop five or six of those delicious looking morsels of orange-y cream cheese-y goodness into my mouth immediately! and that grand marnier whipped cream! my soon-to-be-clogged heart be still! These look so good. Wonderful picture. wonderful if I could use a small tart pan? Your mini cheesecakes are so cute. I could just squeeze their adorable little cheeks! These look wonderful! Jake considers himself to be a great cheesecake aficionado! We will have to try these on for size! This looks amazing! I honestly had no idea there was such a thing as a mini cheesecake pan. I think I may need to buy one as well. Cheesecake is my ultimate weakness in life. I've seen those mini cheesecake pans. Now that I see the cuteness it can create, I think that's next on my shopping list. Awesome photo Nicole. Chris's dad would love this...it contains his fav alcoholic beverage:) Plus it looks so yummy! What a cute little cheese cake! It sounds delicious. You are great at getting just the right photo. I love U & your cake !!!!!!! your my IDOL I didn't think there would be such a thing as a MINI PAN!!!!!! Us vs. Food: Thanks! I saw your comment over at Talk of Tomatoes and meant to point you in the right direction in my comment but then I forgot. Glad you found the link! This is such a beautiful creation! I seriously am itching to own one of these mini pans, as if my collection of baking tins isn't already enough! Ack! I made these today. They were SO easy, and very delicious!